Karen Lynn-Chlup has been an advocate for people with disabilities since she was a small child. She advocated for herself before people with disabilities began organizing into special needs groups. 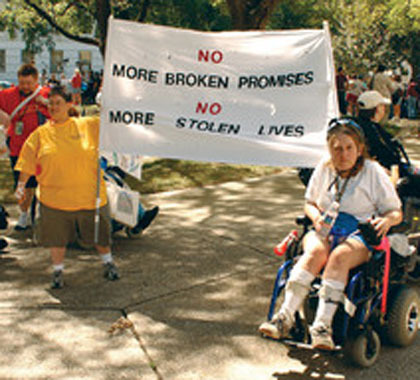 Karen was a pioneering leader in the disability rights movement, and she spoke up for the rights of people with disabilities where others had not. In 2002, Karen was elected to sit on the executive board of Protection & Advocacy, Inc. for a two-year term. While on the board, she worked as part of a team that helped change state and federal laws in favor of people with disabilities. Karen led the effort to update Protection & Advocacy, Inc.’s vision and mission statement to include treating all human beings with dignity and respect. Karen has also made a personal commitment by lending her expertise about the disabled wherever needed. As a special needs advocate, Karen gives unconditionally to others and becomes the voice for their rights. She passionately writes letters on behalf of people with disabilities, and she helps them attain victories during their IEP and IPP meetings. Using her expertise, she also makes recommendations for specific services based on the individual’s capabilities and needs. Most importantly, Karen’s approach to special needs advocacy on behalf of children and parents is to draw upon her own experience in dealing with government and private agencies. Her passion for special needs advocacy allows her to actively help people with disabilities of all ages fight discrimination. Karen Lynn-Chlup happily offers her special needs advocacy service, so if you need help, please contact her.